You guys are very good at processing orders quickly and shipping it fast. I def. appreciate that. Thank you. R2 is an energy supplement loaded with branch chain amino acids, vitamins and minerals that accelerate the body's natural recovery process after intense, prolonged exercise. R2 helps restore correct protein levels, and stave off fatigue and its symptoms, and contains simple carbohydrates that replenish your body's depleted glycogen stores. SPORT BEANS ENERGIZING JELLY BEANS ::Sport Beans�, from the makers of Jelly Belly� beans, are specially formulated to fuel your body before, during and after exercise. Get the nutrition that matches your physiology and see how much better you feel and perform. Focus Formula is a liquid nutritional supplement that is great for all ages. Proper brain development and function rely on good nutrition and Focus Formula gives you all the essential minerals and amino acids you need in one convenient form. With Multi-V, you get more than your average one-per-day vitamin pill. Multi-V is a comprehensive, advanced multi-vitamin and mineral formula, with added nutrients. Over 40 Ingredients With Herbal Extracts To Support Active Lifestyles! ZYM Rival formula has an orange flavor and is designed to replenish electrolytes and B vitamins to provide athletes with fresh legs, natural energy and higher endurance. 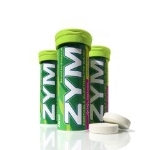 ZYM is effective against fatigue and delivers superior hydration. ZYM Rival is naturally sweetened with no sugar. Cheerpacks provide an immediate, caffeine-free boost of energy for that mid-ride surge or finishing kick. This is fast energy delivery, in a resealable packet. So effective, it's almost like cheating! We all strive to eat for optimal health & performance but it's becoming harder and harder to gain and maintain proper nutritional stasis in this day and age. This is due to our overly stressful, high pace lifestyles & environmental pollutants robbing our bodies of vital nutrients. Combine that with the lack of nutrients obtained from our food due to soil depletion and we as athletes are at a major nutritional disadvantage. Many top sport nutritionists agree that even if you eat a 100% organic diet you may still be nutrient deficient and require supplementation. Think of MVP-365 as the first piece to your "Foundation of Health", your insurance policy if you will. 5-hydroxytryptophan (5-HTP) is an amino acid made in the body from tryptophan and converted to serotonin, an important brain chemical. Raising brain levels of serotonin through 5-HTP supplements may positively impact sleep, mood, anxiety, aggression, appetite, temperature, sexual behavior and pain sensations. 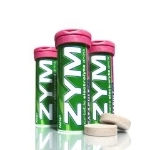 ZYM is the latest innovation in evolutionary electrolyte portable hydration products. A single ZYM tablet provides OPTIMAL HYDRATION ABSORPTION to those who crave it the most: athletes that perform at their highest levels. The Endurance formula provides the perfect balance of electrolytes and B-vitamins essential in order to MAXIMIZE HYDRATION, IMPROVE MENTAL TOUGHNESS and Provide oxygen in the muscles. The great lemon-lime taste has less than a gram of sugar. Try the newest flavor in the EBOOST family. This all-natural, fast-acting shot contains green tea and extracts of blueberry, blackberry, pomegranate, mango, acai, maqui berry and grape seed. Plus vitamins and minerals for a healthy, sustained energy boost and endurance. Fluid Performance is an energizing blend of electrolytes and carbohydrates for sustained energy and optimal hydration during exercise. When used consistently during training & competition, its unique formula helps the body sustain energy levels, avoid cramping, buffer lactic acid, & maintain hydration. It contains a dual source carbohydrate system, bioavailable electrolytes, and Vitamin C, creating an all natural & easy to digest sports drink. FLUID RECOVERY DRINK - FLUID recovery drink is a Fast, Complete, Muscle Recovery drink supplement. Replenish tired muscles, reduce workout soreness, support a stressed immune system, and much more. Professionals everywhere agree, to get the most out of your workouts, you have to get post workout nutrition. FLUID Recovery Drink replenishes and rejuvenates the body with only the highest quality ingredients available. FLUID's simple and effective formula delivers results unlike any other product on the market. With 50 times the amount of immune boosting L-Glutamine per serving as other drinks, the recovery power is unmatched. Generous amounts of whey protein isolate and complex carbohydrates rebuild and energize your muscles, while Vitamin C, sodium and potassium put the body back into balance. Enervit G Sport Drink delivers carbohydrates for energy, with mineral salts and vitamins to fight cramping and keep you performing at your peak throughout your workout. G Sport restores your body's mineral balance and speeds hydration. Use it to pre-hydrate, keep you going during your ride, and speed recovery by quickly restoring lost fluids after you're through. "The DZ in DZ-NUTS" Designed for Dave Zabriskie (DZ) by a pharmaceutical scientist to reduce and relieve chafing, irritation, and protect fragile perineal skin from bacterial and fungal infections. Formulated for real and synthetic chamois. We call it electrolytes with a buzz. ZYM Catapult is infused with guarana (100mg of caffeine), a natural stimulant to maintain stamina and combat fatigue. Available Flavour Limone (Lemon)�Only at this time. Enervit's gels provide specific, highly effective delivery of immediate energy during exercise, without causing reactive hypoglycemia. Branch chain amino acids help reduce fatigue, and improve muscle tone. The Calplex (120 Tablets) sports calcium formula is for optimal bone mass, bone strength. The Calplex (120 Tablets) is also to prevent stress fractures and osteoporosis. Conditioning 90 Caps by Amino Vital is an amino acid recovery and energy formula that provide your body with the fuel it needs to maximize training recovery and progress. Conditioning contains glutamine and arginine plus 12 essential vitamins and minerals. Rebuild and replenish your muscles with Fluid Recovery Drink�- the most complete recovery drink to speed muscle recovery and improve physical performance. To function properly the body requires certain basic nutritional elements including vitamins, minerals, amino acids, enzymes and antioxidants. Unfortunately our diets today do not always provide us with what we need in sufficient quantities. According to the U.S. Department of Agriculture almost half of us are deficient in at least one significant nutrient. In order to maintain vibrant health we may need a nutritional supplement to meet our needs. Life Essentials Plus offers a broad spectrum of vitamins, minerals, antioxidants and other natural ingredients in one complete formula. This combination allows the micronutrients to work together synergistically improving absorption and assimilation. If you are struggling to lose weight and at the same time you find yourself consuming a lot of fat and sugar, then our Fat Blocker may be the perfect formula for you. Fat Blocker is designed to block the amount of fat and sugar that the body can absorb from your food. E-BOOST - E-BOOST Orange Tube of 10 Effervescent Tablets packs immunity-boosting Vitamin C, a large dose of B-Vitamins to boost performance, and 5-HTP for mental acuity, into a refreshing, orange-flavored beverage that is gentle on your stomach. Just add water. Designed specifically to boost immunity, relieve fatigue and wake up your mind, E-BOOST provides an overall wellness "boost" to help you get the most out of your day. E-BOOST - E-BOOST Orange�packs immunity-boosting Vitamin C, a large dose of B-Vitamins to boost performance, and 5-HTP for mental acuity, into a refreshing, orange-flavored beverage that is gentle on your stomach. Just add water. Designed specifically to boost immunity, relieve fatigue and wake up your mind, E-BOOST provides an overall wellness "boost" to help you get the most out of your day. 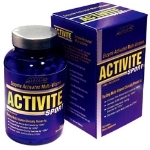 Activite Sport is an advanced multi-vitamin/mineral designed specifically to meet the extra nutritional needs of athletes. Activite's formulation is superior to conventional products and features a high quality selection of nutrients, including vitamins, minerals, antioxidants, phytochemicals, vital metabolic cofactors and specialized enzymes in the exact ratios needed to create exponential synergies' and maximize their effects. Honey Stinger Organic Energy Chews. Certified organic, certified gluten free, fortified with 100% RDA vitamin C, this is a delicious snack or energy source! Sweetened with organic honey and tapioca syrup, these chews provide a natural and sustainable source of energy with the multiple carbohydrate sources: glucose, fructose, maltose, sucrose. GU Chomps utilize GU Energy Gel's proven blend of carbohydrates, amino acids, antioxidants and electrolytes to make a chewable form of GU. Each box contains 16 packets, with each packet containing 2 servings. Go ahead and sink your teeth into GU Chomps. The premium quality ingredients in GU Recovery Brew help you quickly replenish energy stores and rebuild muscles after an intense workout. You'll notice a difference when you compare us to the competition. Suffice it to say that recovery drinks have not been known for their taste. Until now. Say goodbye to grainy, chalky, salty and smelly. GU's Recovery Brew reinvents the category and evolves this critical training tool into a nutritional experience we're confident you'll actually enjoy. Hammer Premium Insurance Caps - Regular replenishment of basic nutrients such as vitamins and minerals is crucial for optimizing athletic performance and supporting optimal health, and PREMIUM INSURANCE CAPS is your first step towards achieving both. Athletes and active people deplete nutrients at substantially higher levels than sedentary people do, which makes regular use of PREMIUM INSURANCE CAPS a wise strategy. Fill nutrient gaps in diet. More energy throughout entire day. Reduce post-workout muscle soreness and inflammation. Lipoic acid (in the preferred "r" isomer form used in Mito Caps) is often called the "universal antioxidant" because, unlike other antioxidants, it scavenges both water and fat-soluble free radicals. For all athletes, regardless of size or age, suggested dose is 1 capsule three times daily, with food, on non-workout days. On workout days of 90 minutes or less take 1 capsule 30-90 minutes prior to workouts (with or without food) and 2 capsules after workouts with food. A 4th capsule may be taken with dinner on workout days that were 60-90 minutes in length. For all athletes, regardless of age, suggested dose is 2 capsules 30-60 minutes prior to exercise (with or without food), 2 capsules after exercise with food, 2 capsules with dinner. If workout exceeds two hours, 1 additional capsule may be taken every hour during the workout. VO2-BOOST is a powerful endurance enhancer clinically proven to dramatically improve athletic performance. The patent-pending VO2-BOOST formula has been developed through extensive research and has been shown in independent laboratory testing to promote speed, endurance and strength in University athletes in one month! You will move faster, feel stronger and have more endurance with VO2-BOOST than anything else on the market...Guaranteed.